Lenovo and Google have been working together for a year to find a mainstream use for Google’s experimental Project Tango technology. Today we’re getting information about the very first Google Tango device for consumers. They’re actually gonna do it. This is very ambitious. Ever since Google first showed the world its 3D-aware technology about two years ago, it’s been pretty hard to explain what exactly Project Tango technology does. In short, it uses a variety of sensors to give a mobile device a realistic awareness of the physical world around it so that you can interact with it. Basically, the goal is to develop sophisticated augmented reality on a mobile device. The sensors on prototypes included a depth sensor, an RGB camera, a motion tracking camera, as well as more common sensors like a gyroscope an accelerometer. What’s it for? Using one of the currently available development kits, Tango’s leader Johnny Lee quickly mapped the stage at the press event and placed a fridge in a corner. It fits! Imagine quickly modeling a room in your house and then placing different pieces of furniture around so you can see how it looks before you make the mistake of buying the wrong sofa. There are many other creative applications created by developers, from gaming to virtual reality. Today’s update on the technology and the Google-Lenovo partnership revealed some new information about the Project Tango device, but development won’t be finished until summer 2016. 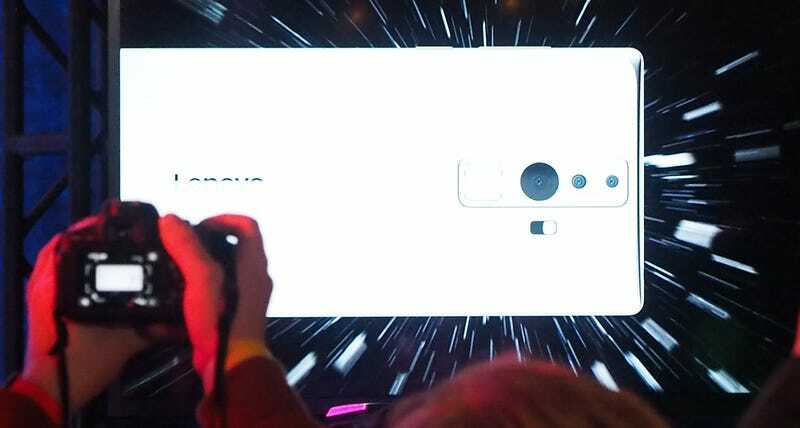 We’re told the device will be “under 6.5-inches” and that the camera system—including a fisheye lens, an RGB camera, and a depth camera—has been redesigned in a vertical stack so that you can use the device in portrait mode instead of landscape, as the previous versions required. And finally, despite the fact that the developer versions used specialized chipsets, the Lenovo device will run a Qualcomm Snapdragon processor. The price? Under $500. We didn’t see finished hardware, but it’s certainly exciting that Lenovo has enough confidence in Project Tango as a technology to make it available in the real world. Now we wait for the consumer-ready version.